A very good news for all the job aspirants. CSC Off Campus 2018 Drive For Freshers notification released. All the interested and eligible candidates can apply online to this recruitment drive through the provided registration link. 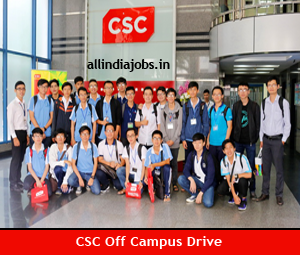 In this article, we have equipped all the details of the CSC off campus drive that will help in reducing your wastage of time in the searching process. With the help of the data provided in this article, the candidate can start the preparation for the interview. Having a good preparation the aspirants can perform well in the interview and get the job immediately. This article is to make all the graduates of the years of 2017 and 2018 notify about CSC Off Campus 2018 Drive For Freshers. All the students who are in the search of the job can make use this golden opportunity and secure the job. Having a job from the top companies will be giving a bright future for the candidates. So, we request the candidates to start preparing for the interview from right from this moment, so that you can get the job easily. You can make use of the CSC interview questions, syllabus, placement papers, and many other details that are provided in this article to help them in their preparation process for the interview. Students who have got their graduation in 2017 from BE / B.Tech / ME / M.Tech, M.Sc in Computer Science / Information Technology MCA with B.Sc / B.Com / BCA / BA (with Math / Statistics / Computers Background) streams and also the students who be completing their graduation in the year 2018 can apply for CSC Off Campus 2018 Drive For Freshers with the help of the link that is given at the end of this article. There will be some required skills to handle any job perfectly. Here are some the skills that are looked over by the interviewers of the CSC Company when they are hiring candidates from the CSC Off Campus 2018 Drive For Freshers for various positions. Candidates with good technical skills are preferred. Any additional certifications will be an added advantage. The first round is an online written exam, where you will be having some objective questions from arithmetic, reasoning, and aptitude. There is also a descriptive test included (should write an essay on the given topic). The test duration is 90 minutes and there is no negative marking. The technical round may be sometimes included in the online exam itself or may be conducted separately. The candidates who have got qualified in the above test(s) will be having the final round of HR interview. The candidates who are interested to apply for CSC Off Campus 2018 Drive For Freshers should necessarily have an aggregate of 65 percent throughout their career. The students who are having any current backlogs need not apply for this post. The interviewers will not consider any candidates as eligible ones for the interview. The salary for a fresher would be generally ranging from 3 lpa to 3.5 lap at CSC. this may be having slight changes as per the norms of the company. Candidates may check the official website for more detailed information.There will also be some additional benefits in addition to the basic salary. Candidates who are satisfying the above-mentioned criteria can proceed for the CSC Off Campus 2018 Drive For Freshers with the help the registration process given. To make it easy for the eligible candidates we are providing the link by which candidates can directly apply to the vacant positions. Give a click on the link provided. Fill in the details that are asked. Recheck the details before submitting them. You will now get a reference id and password, which are required further. Now, you completed your registration process successfully. The candidates willing to attend the CSC Off Campus 2018 Drive For Freshers are requested to carry the below-mentioned documents along with them at the time if the interview. Marks memos of the tenth, inter, and previous semesters. Here are the required tips for you to crack the interview at CSC Off Campus 2018 Drive For Freshers. Following the tips, you can give out your best at the interview. Get prepared with the technical subjects. Try to use short sentences with accurate meaning. In our webpage www.allindiajobs.in you can find the details of all the latest job openings from the top multinational companies. To get any further updates regarding CSC Off Campus 2018 Drive For Freshers and also for new notifications, keep visiting our web page regularly.